Many Shilajit products on the market are not the real thing, so buyers beware. If it comes in powder form, it is counterfeited. If you want to get high-grade resin, you will have to buy it from a company that has proven to be of good standing and reputable. Do not fall for companies with extravagant claims on how great their product is. Always do your research first before buying supplements. The powdered form of this product is not real. The genuine supplement is rather expensive. Because of the cost associated with the herbal supplement, unscrupulous vendors have taken it upon themselves to make a quick buck. They fool unsuspecting buyers into thinking that they are paying for a genuine product. The following contains fake Shilajit Powder (only resin is genuine): Capsules, fortified nutrient bars, fortified juices, and other harmful combinations. The counterfeit product gets marketed as having the main ingredient of Shilajit, but there is no authentication process. The real Shilajit gets manufactured in resin form. It has a tar-like consistency. It is a slow process to extract the resin from rocks that contain Shilajit. https://purblack.com has campaigned long and hard to get the word out and warn people of the harmful counterfeited product. Shilajit has numerous health benefits, but it has to get used it its purest form – resin. The product gets manufactured using scientific technology. Any other means of procuring Shilajit is questionable. Beware of scam artists. In the ancient Ayurvedic scriptures, Resin has been lauded as a miracle. Scientific research has yielded numerous benefits of Resin. The organic matter of Shilajit gets trapped between rocks over the years. During the summer, the substance seeps through the rocks and appear in a sticky formation. The rocks exist only in Caucasus, Siberia, and the Himalayan Mountains. They are hard to find. That is why the product is so expensive. Based on the formulation of Resin, it is easy for unscrupulous vendors to grind up any natural rock and sell them as Shilajit. People who are unfamiliar with the manufacturing process will buy these fake products thinking that they are real. These stones are said to be of the highest quality, unlike sedimentary rocks that get used for the fake Resin. The capsules on the market only contain a tiny amount of Shilajit. This little-known fact gets hidden with the use of Fulvic acid. If you see the labeling on the product marked as â€˜high strength,â€™ it is because they use a large number of Fulvic acids. The counterfeit gets made from dirt and gets passed off as genuine. The actual supplement comes in Resin form. Extracting the matter from the rocks takes well-trained individuals using scientific means. It is an art form onto itself. 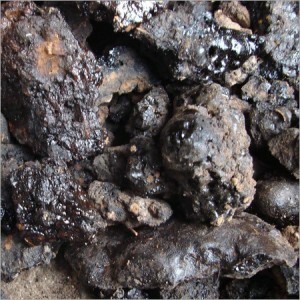 The individuals doing the extracting have to have the background knowledge of the chemical processes behind Shilajit. The process has to get done without tainting the properties while getting rid of all the impurities. Pürblack sells Shilajit in its purest form. They are familiar with the extraction process so that harmful chemicals will get eliminated from Shilajit. The Resin gets preserved without any contamination and lab tested to make sure that the product remains pure. The jar has proof via a serial number to link to the certificate analysis performed during testing. Using a combination of Shilajit and Ashwagandha will give the user vigor and vitality. Ashwagandha is Indian Ginseng. The health benefits of the herb include boosting the immune system; aids in learning and memory, and it helps with anxiety and depression. It will also strengthen sexual libido and maintains a healthy blood sugar level. In conclusion, Shilajit gets marketed in various counterfeited form. They claim to have the properties of Shilajit, but the allegations are untrue. Most of these fake products contain harmful chemicals that could damage your kidneys. These companies grind up sedimentary rocks and sell them to unsuspecting people. The resin in powdered form is not real. If you see the labeling on the product marked as â€˜high strength,â€™ it is because they use a large number of Fulvic acids. The counterfeit gets made from dirt and gets passed off as genuine. Only one company sells Shilajit in its original form â€“ Pürblack. They are familiar with the extraction process so that harmful chemicals will get eliminated from Shilajit. The Resin gets preserved without any contamination. They perform lab tests on the resin that gets extracted to make sure that the product remains pure. I love reading through your websites. Regards!